A retired primary school teacher and social entrepreneur is hoping to deliver two 40 feet ocean freight containers of educational resources to schools in Africa over the forthcoming month. David Miles-Hanschell, who is based on the Isle of Bute, Scotland, taught in Canadian and Scottish schools since 1974, and retired from teaching in 2008. David, who was raised in the West Indies island of Barbados, is the founder and executive director of Scottish charity Surplus Educational Supplies Foundation, that specialises in the supply of school resources to those in need. Following Hurricanes Ivan and Emily in 2004 on the West Indies island of Grenada, David was inspired to help the victims of the disaster and set up an initial project at North Bute Primary School. After raising funds, he organised delivery of old textbooks, furniture and computers for the Grand Roy Government School on the island. Since his initial entreprenurial fundraiser, David has set up various charitable initiatives to supply and deliver educational resources to international schools for more than a decade. His charity efforts quickly gained momentum and in February 2008, Surplus Educational Supplies Foundation received official charitable status from The Scottish Charity’s Regulator and was entered on the Scottish Charity Register. His current project is the latest in a line of efforts to send surplus educational material from Scotland to communities hit by poverty and natural disaster in Africa and the Caribbean. Other social entreprenuerial projects include the delivery of a 40 feet container of educational resources to the Grenada Boys Secondary School (GBSS) in 2008, financed entirely by David’s own funds; and in 2009 arrangements were made with West Dunbartonshire Council to send a container load of primary school educational resources from Golden Hill Primary School to Ghana. Corporate support in 2011 from Riverside Inverclyde Properties Ltd, James Walker Devol Engineering Ltd , National Semi Conductor (Texas Instruments) and retailer Morrisons has enabled the charity to purchase large quantities of textbooks from the English ,science and social sciences departments of Scottish high schools including The Greenock Academy, The Gourock High School, Notre Dame High School, and Port Glasgow High School. These educational supplies were recently transferred into storage in September 2012. 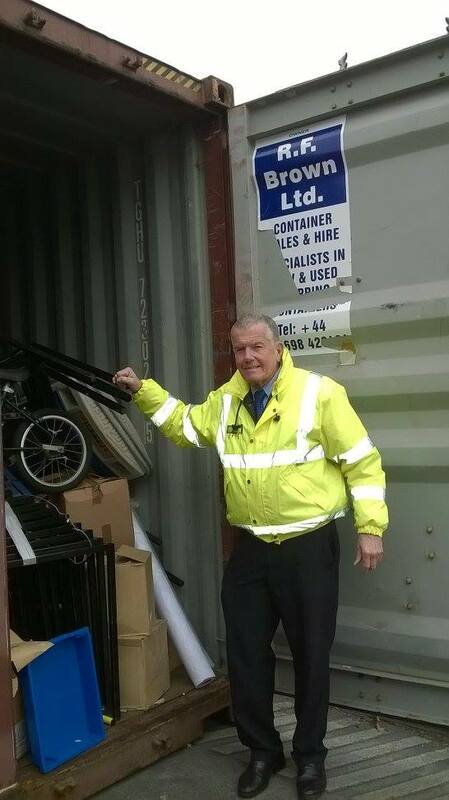 Councillor Terry Loughran, Inverclyde Council’s Education and Life long Learning Committee member, summed up the David’s charity efforts and its impact on international communities and the logistics industry: “The commitment David has shown over a number of years and the effort he has put in has made a difference al lover the world is astonishing. He is providing a service to the people of Inverclyde by using books we no longer need.